Couples Resorts offer the perfect romantic getaway to spend some quality time with your loved one. Situated in Jamaica, Couples Resorts, are four luxury all-inclusive resorts that cater exclusively for couples. The beautiful oceanfront resorts feature white sandy beaches, crystal clear waters, exquisite cuisine, exciting excursions and remarkable service to match. Here’s what’s included at Couples Resorts during your holiday. Couples resorts strive to delight guests’ palate with an array of delicious dishes. Whether you have a hunger for Jamaican food or something vegetarian, there is a restaurant to suit every craving. Experience fresh local seafood, island produce and the local spices at one of the magnificent restaurants available to guests. With all dishes created by internationally recognised chefs you are guaranteed a tasty meal. At Couples Resorts, guests can enjoy a variety of complimentary activities and entertainment. Start your morning with a facial, a body message or a yoga session at your resort spa. Enjoy a friendly tennis contest at the professional tennis courts or a day of golf at the stunning Negris Hills Golf Course. With transportation included, you and your loved one don’t have to worry about anything. Finish the day sipping a fresh fruit smoothie, savouring a signature martini and dancing to the sound of live local music in one of many chic bars. There is plenty to do at Couples Resorts! Each resort offers fabulous excursions and all kinds of watersports for guests to enjoy with no extra costs. Go swimming, kayaking, snorkelling or paddle-boarding for some fun in the warm turquoise waters. 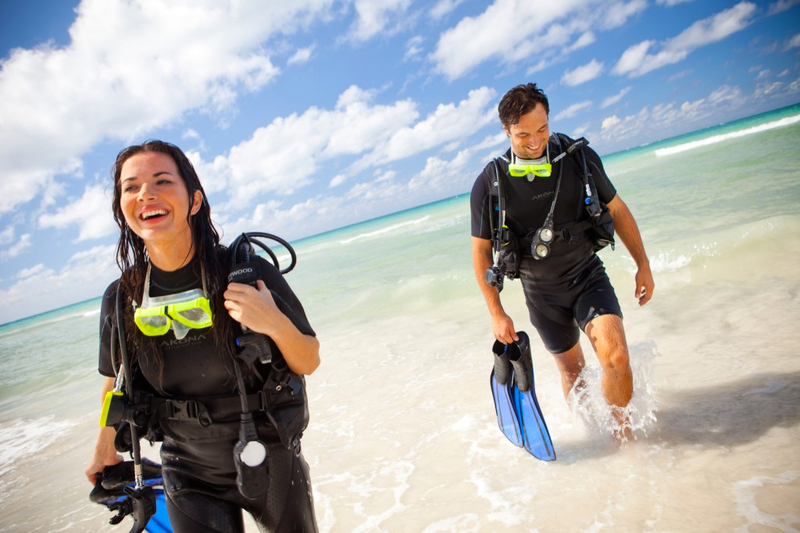 At Couples Resorts you can scuba dive by day and night. Whether you are a seasoned pro or you have never done it before, you can dive at ease with a licenced instructor at your side. Complimentary excursions are also included at Couples Resorts and run daily to some of Jamaica’s best-loved attractions, including Dunn’s River Falls and Margaritaville. Our top tip? Don’t miss the sunset Catamaran cruise. Jump off the deck, see breathtaking views and gaze at the sunset for the a romantic evening unlike any other. Want to see some local wildlife during your trip? Don’t miss out on the glass bottomed boat ride. It’s a real treat! The shopaholics among you will love taking advantage of our complimentary shopping shuttle. We will transfer you to the stores and back – the shopping is up to you! Thinking of taking a romantic break to Couples Resorts with your significant other? Contact us today to find out more about the four luxury resorts and we will help you find the best resort for you!